Awaken to the field of magic & miracles! If you’re going to be separated from your pet for any length of time, you’ll find peace of mind in knowing that you really can “talk” with them about it beforehand, as well as connect with them while you’re apart. It’s natural, and not all that difficult. When we’d had our first yellow lab for about a year, we left him behind when we went on vacation. It happened to be the day after we reprimanded him for eating a sandwich off the coffee table. We took him to the boarding kennel the next day, said goodbye, and flew off to Hawaii. We returned 10 days later and picked him up at the kennel. He was more than ecstatic. Even as we were getting into the car he was still licking us, squeaking, and panting. Just as we all settled in for the hour-long drive home, it hit me — and it wasn’t just a thought. I literally felt it like a stab in the heart as I realized he thought we had abandoned him. He had no idea we were coming back for him. I knew this with certainty. Immediately I began crying and trying to explain to him that we would never leave him like that. But by then he’d already gone through 10 days thinking we had. Never ever did I want to do that to him again. The main technique is that of speaking to them in pictures as you learned in part 3 of this series. And you’ll feel more confident that you’re actually connecting if you take the time to practice the exercise from part 1 as well. If you know ahead of time that you’ll be separated, that’s ideal. Even if you only have a few minutes, that’s enough in most cases. For complex situations there are several actions you can take that take more time, but for the most part what you need to do is pretty quick. 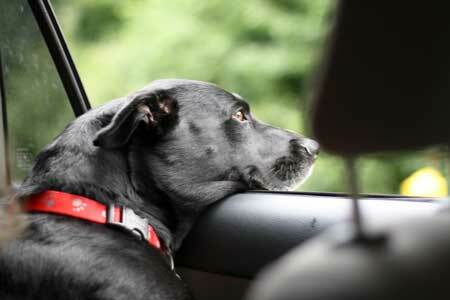 The general idea is to prepare your pet for what they’ll experience while you’re separated. There are lots of aspects of this. Think about how you experience time, how they experience time, and then how you can put that into pictures. If it’s hours, you might show them you’re gone until you come home and feed them dinner. Or maybe you’re gone until it gets dark. See them at home while it’s light; imagine it getting a little darker, then see and hear your car returning home. If it’s days, see it getting dark, then light, then dark, then light again (for however many days it will be). Some animal communicators say that animals can understand numbers, e.g. I’ll be back in 3 days. I don’t disbelieve that but if you want to do that I suggest you also use visuals along with it, at least until you have a sense your pet understands. Imagine the people your pet will likely encounter. If you know what they look like, all the better. Sometimes you don’t (for example, if you’re boarding a pet there may be various people at the kennel). You can imagine people while you think consciously of the concept that there will be a lot of people around. If they’ll be home, or maybe in a boarding environment, show them that too. FEEL and project the idea of safety while you show them where they’ll be, with whom, and their daily routine. You may be aware of some of the activities your pets will experience. If so, play them out in detail if you can. Again, the most important thing is that you FEEL safe and calm. See them having fun and enjoying themselves. If you just can’t imagine it being pleasant for them, then see if you can feel them experiencing it as an adventure. It can be especially helpful to anticipate the things that may upset your pet and play through those with that sense of safety. For example, if your animal will be traveling by plane without you, play through the noise and commotion of a busy airport, what it might feel like in the cargo hold, etc. All the while, assure your pet they are safe. Most importantly, see the two of you being reunited. Do this last, so that what you are telling them is as much in order as you can make it. Don’t worry about every little detail being right or even that everything be in perfect order. You just want to get the general ideas and feelings communicated to them. That’s enough, as that’s a lot! Most pets don’t get the luxury of anything even close to this kind of connection. If you’re just separated for a short time (e.g. hours), you don’t need to do anything to reconnect unless you want to or unless your pet suffers separation anxiety. But if it’s a longer period of time, it can help to check in periodically. When you have a quiet moment (eventually, you don’t even need it to be quiet), just connect with them. Use a photo of them if it will help. And then simply repeat some of the things you communicated above, all the while feeling a calm sense of safety and contentment. A lot of people are so connected with their pets and vice versa that they worry whenever they’ll be separated for a long period of time or during unusual situations. This is one of the worst things you can do. It really helps them if you remember that you have done everything you can to keep them safe and happy and the final ingredient in that being possible is for YOU to feel calm and happy about it all. They do sense that and it does make a difference. Take a look at part 2 of this series for some ideas of ways to think about it which will help you both be more at peace while you’re apart. This isn’t specific to Animal Communication but here are some other things that can help you both feel more calm too. Whatever you can get them used to ahead of time: do! Whether it’s the people they’ll be with, crates they may travel in, certain foods they’ll be eating, environments they’ll be in, etc. Do whatever you can to expose them to those things for short periods of time and in a calm manner. And make them positive experiences as much as you can. Maybe give them treats during or after if that makes sense. If possible, leave something of yours with them while you’re separated. This is especially good for dogs or cats, who rely so much on their sense of smell. So, for example, a t-shirt you’ve worn or a blanket you’ve used can go with them in their crate or to the kennel. Use Bach Rescue Remedy during and after. You can have a caretaker put it in their food or water just like they would a medicine. Or if you’re leaving them with a blanket or t-shirt, you can spray it with Rescue Remedy beforehand. Afterwards it helps them process any kind of trauma they may have experienced. This is a lot to absorb at once and I’ve only scratched the surface, but I’m sure you can use your own creativity to expand these ideas to fit whatever situation you might be facing. That’s half the fun of it, after all! Let me know if you have any questions. Or if you have experiences with this kind of thing, or other suggestions, please let us all know. Thanks for reading, and happy holidays to you … and your pets! Do You Cry For Butchered Trees? This is amazing information. Deep thanks! Hi, I'm Patti Foy, and if you want to shine the light that is the authentic you as freely as possible, then this site is for you. I've learned how to get down-to-earth, practical results by working at the level of energy and consciousness. Here I share concepts, tools, tips, and techniques so you can, too. You'll also find related inspiration and guidance, and access to my life-changing and empowering services. >> What is Quantum Consciousness? Activate Magic and Miracles With Me! >> Who can use this? Why Emergence Is for Everyone – Even You! >> How we "emerge" holographically into our lives ... naturally. >> What are they? Here's a good description. Spring into Manifesting: Free Activation! >> An example: What happened during the Creation Activation this summer? Subscribe to my newsletter to be notified of upcoming Activations. Check out some of the books in my Amazon Store. They will blow your mind! >> A few sample posts about expanding, applying, and getting results. What If This Simple Question Could Change Your Life? Are You a Door or a Doer? 3. Plug into "The Field" consciously by entering "The State"
But also, check out any of my posts about Consciousness. Use the "Post Topics" panel especially Intuition, Guidance, and Channeling topics. Business Goddess Course :: A-MA-ZING! Confused? Stuck? Vedic Astrology to the Rescue! How Does Vedic Astrology Differ From Western Astrology? Jyotish Astrology: A Shining Gem(stone)! Who Are You Without Your Story? There is no paid advertising on Lightspirited Being. However, I do participate in a few affiliate programs where I earn a small fee if you make a purchase after clicking through one of my links. But rest assured, I only recommend books and products I absolutely love! Thanks for reading and helping make this site sustainable.